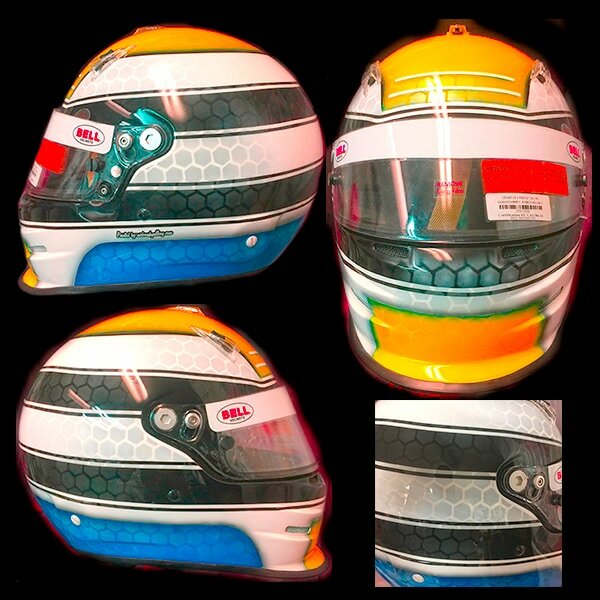 Race helmet design 46 is a Bell GP3 race helmet designed and custom painted for Gabriel Glusman. Gabriel raced in the 2017 Indy Car race of champions and it was a pleasure to design and paint his helmet. Gabriel Glusman was one of three people to win a chance to race in the Indy Car Race of Champions 2017 and I was honored to work with him on a his helmet.Time frame on this helmet design, painting was very short but we got it done in time for the race. Working closely with Gabriel I put together a design he really liked and it turned out pretty sharp. Blue, yellow, black and white are the main colors with some honey comb effects thrown it to jazz the design up. Contact me today to get started on your helmet. If You Like This Helmet Design Please Share it With Friends, Choose Your Platform!